Pompeo and Crown Prince Mohammed bin Salman held talks on the alleged murder of a Saudi journalist on October 16. Saudi Arabia has repeatedly rejected allegations and "any attempts to undermine it whether through threats to impose economic sanctions or the use of political pressure" over the Khashoggi case. Turkish President Tayyip Erdogan will hold talks with US Secretary of State Mike Pompeo, who arrived on a working visit to Ankara on October 17. The US-Turkey talks are expected to focus on the disappearance of Saudi journalist Jamal Khashoggi, the Turkish Ministry of Foreign Affairs told Sputnik. Mike Pompeo has held talks with Turkish Foreign Minister Mevlut Cavusoglu discussing the journalist's disappearance and Syria's Manbij, according to reports. The state-owned agency Anadolu reported, citing Interior Minister Suleyman Soylu that Turkey is waiting for a joint agreement to search the Saudi Consul's Istanbul residence in connection with the disappearance of Khashoggi. According to the Turkish president's press service, Erdogan will meet with Pompeo at the Ankara airport before leaving for Moldova. Mike Pompeo earlier stated that the Saudi government had pledged to get to the bottom of The Washington Post columnist's case. 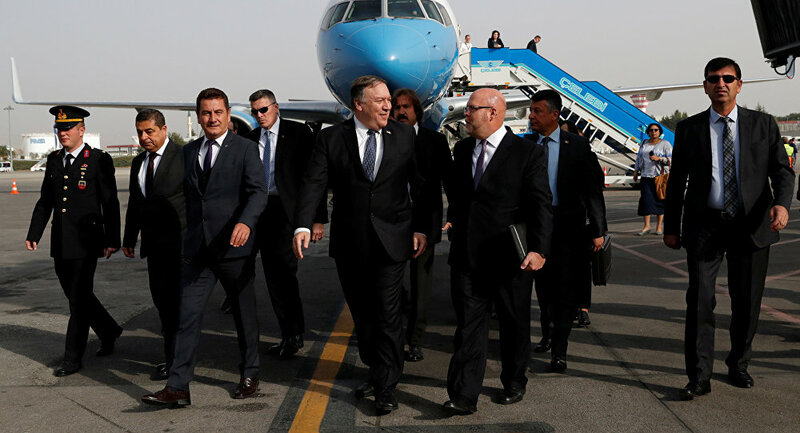 On October 16, Pompeo visited Riyadh, where he held talks with Crown Prince Mohammed bin Salman and thanked the Saudi government for providing support for a transparent investigation into the suspected murder of Khashoggi. Khashoggi disappeared after visiting the Saudi Consulate in Istanbul on October 2. According to the journalist's fiancee, he was invited to the consulate to receive documents but never left the diplomatic mission's building. The Saudis claim Khashoggi left the building unharmed and vehemently deny all the allegations of murdering the columnist.